Srinivas Nidugondi, senior VP and head of mobile financial solutions, Mahindra Comviva, has over 18 years of experience in various industries including financial services, payments and commerce in a variety of business and product related roles and most recently with a specific focus on enabling banking, payments and related services through digital channels. He talks to Future Banking about the future of mobile finance suites. Could you please tell us a little about Mahindra Comviva as a company? Srinivas Nidugondi: Mahindra Comviva is a global leader in providing mobility solutions. It is a subsidiary of Tech Mahindra and a part of the $16.5-billion Mahindra Group. We are committed to accelerating the adoption of digital commerce through our comprehensive portfolio of solutions that caters to the entire ecosystem. Our mobile financial suite of products powers over 120 customers in 55 countries and serves over 750 million mobile users globally. We offer solutions for issuing as well as the acquiring business. Our mobiquity® Wallet represents an evolution in mobile commerce, integrating payments, loyalty and mobile marketing. It is one of the first wallet platforms to use NFC - SE and HCE, QR code, biometrics and BLE - to create compelling consumer experiences. We offer an end-to-end HCE solution including a patent-pending hybrid HCE offering powered by our tokenisation platform. By integrating location, identity and social features, mobiquity Wallet enables a whole new level of digital transaction flexibility by offering personalised and context-aware services. On the acquiring side, Mahindra Comviva's payPLUS offers an integrated payment acceptance solution for merchants. It fully complies with EVM Chip+PIN and Chip+Sign global standard to offer multiple payment options and enables businesses to leverage location-based services, to deliver contextual promotional campaigns. It seems like 2014 was the year that things got very serious very quickly in regard to mobile payments. What do you believe is in store for mobile payments in 2015? focus on value-added services like contextual commerce with geomanagement, social and analytics will play a central role in consumer experience management. How important is it that a mobile wallet isn't simply just another method of payment, but can also incorporate value-added services, such as loyalty programmes for example? For any new offering to become mainstream, it should fulfil an existing need or address a latent need. Thus, a mobile wallet must go beyond payments. There is no incentive for the consumer in tapping a phone instead of a card. We need to reduce the switching cost by providing relevant information at the right time. Mobile by virtue of being an intelligent device with an interface makes it a perfect medium. Consumers today are spoilt for choices - be it payment cards, offers, loyalty benefits. If my mobile can provide me with pertinent information - the closest store that has the product I want, the best price available, the additional discount that my credit card offers at a merchant store nearby - then it creates that additional benefit. Further, through my phonebook, messengers or my social accounts, the mobile links me to anyone and everyone I know or wish to know. Services like social transfers, split bills, shopping assistance through recommendations and social-media feedback allow the consumer to simulate the real-world purchase decision and socialise an action. The wallet that allows the consumer such added benefits would be the one that will be able to make mobile the instrument of choice for payments and beyond. There is a lot of chatter on HCE and tokenisation being the panacea for all ills for NFC payments. What are your views on this? We have always been strong advocates of NFC payments. It was the ecosystem that was letting this great technology down. HCE and tokenisation have helped change it for the better. Apple Pay is a perfect example. Though it does not use HCE, it relies on card-network-backed tokenisation systems. We will see multiple variants of tokenisation and HCE supporting different business models. However, as with any pure software solution, the level of security would be comparatively less than a hardware-based solution. Thus, based on their risk appetite, FIs would choose to go the pure HCE or hybrid HCE route with tokenisation to launch NFC payments. Security is top-of-mind with consumers these days when it comes to mobile payments, especially with the news that fraudulent activity is being conducted through Apple Pay. What can banks do to address consumer concerns around security? limit damage in case of a breach. 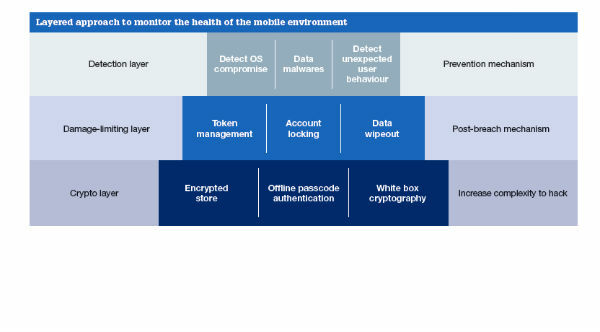 To achieve the above goals, we believe in a layered approach (see figure, above) that uses mechanisms such as encrypted stores and white-box cryptography to increase the complexity of the system; to continuously monitor the health of the mobile environment to detect any attacks and trigger immediate mitigation actions in case of a breach. Where do you see the future of payments? The way we buy has changed and so has the way we pay. Digital payments are here to stay. Gone are the days where we pulled out stacks of currency notes from our wallets to pay for goods and services. The mobile is native to the millennial generations and they consume and process information differently. Banks that are going to remain relevant need to focus on user behaviour and design solutions that take into account the paradigm shift in behaviour powered by technology. However, mobility and 'not mobile' is what banks should focus on as a part of their digital payment strategy. Consumers will expect a seamless experience whether they use their phones, watches, tablets or voice commands to pay. 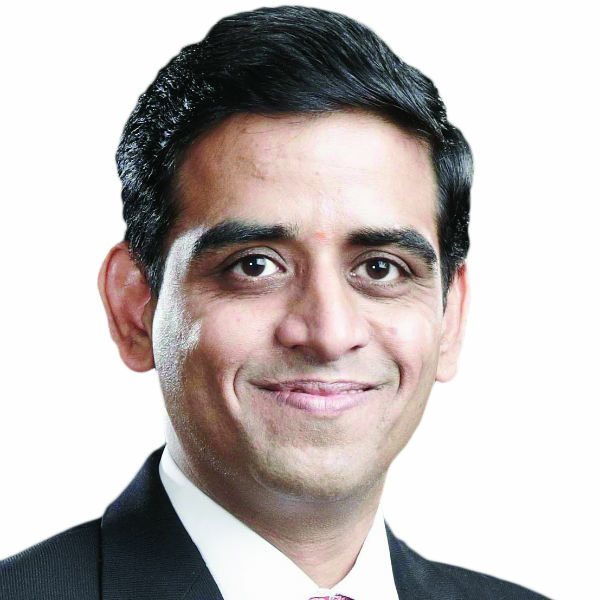 Srinivas Nidugondi, senior VP and head of mobile financial solutions, Mahindra Comviva.